Figure 1 Schematic representation of a CW with HSSF. 1, distribution zone filled with large stones; 2, impermeable liner; 3, filtration medium (gravel, crushed rock); 4, vegetation; 5, water level in the bed; 6, collection zone filled with large stones; 7, collection drainage pipe; 8, outlet structure for maintaining of water level in the bed. The arrows indicate only a general flow pattern. From Vymazal J (ed.) 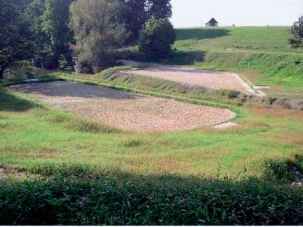 (2001) Transformations of Nutrients in Natural and Constructed Wetlands. Leiden, The Netherlands: Backhuys Publishers. Figure 2 HSSF CWs in Sedlce, Czech Republic shortly after planting. Photo by J. Vymazal. before discharge via level control arrangement at the outlet. During the passage of wastewater through the reed bed the wastewater makes contact with a network of aerobic, anoxic, and anaerobic zones. This concept was developed in the late 1960s in Germany by Dr. Kathe Seidel in Plon, Germany. Seidel designed the system with filtration material with high hydraulic conductivity, for example, gravel or coarse sand. However, Reinhold Kickuth from Gottingen University, Germany, developed another system under the name 'root zone method' in the 1970s. Kickuth's sys tem differed from Seidel's system in the use of cohesive soils with high clay content. The first full scale HF Kickuth's type CW for treatment of municipal sewage was put in operation in 1974 in the community Liebenburg Othfresen.